When it comes to easy, family-pleasing recipes, it's hard to beat a frittata! 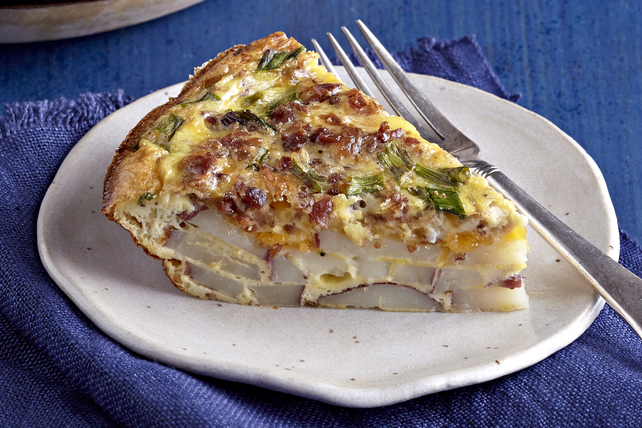 This frittata is made with new red potatoes, shredded cheddar and bacon bits. Spread potatoes onto bottom of 9-inch pie plate sprayed with cooking spray. Top with cheese, bacon and onions. Whisk eggs and milk in medium bowl until blended. Add Miracle Whip and pepper; mix well. Pour over potato mixture. Bake 25 to 30 min. or until centre is set. Let stand 10 min. before cutting into wedges to serve. Serve with crusty bread and a crisp mixed green salad tossed with your favourite Kraft Dressing.